NOTE: All letters in this series were done with a #4 round carbide dental bur on flat glass. Guidelines are 1/4″ apart. The top and bottom lines are the boundaries for the ascenders and descenders. The drill is running continuously during the entire letter. THE LOWER CASE g begins with an oval, precisely as described earlier for the a: An oval begins at the top guideline. Place your drill at 12:00 and with a steady, slightly heavy pressure, make the left side of the oval. As you approach the baseline, reduce the pressure to as light as possible that will still show. That transition to a hairline stroke should come up off the baseline, with a matching curve on the right side, to finish the oval at 12:00. Make the stroke slowly to create a seamless connection at the top. You should have a perfectly-shaped oval. The second stroke begins with a broad stroke, at the angle shown, continuing to halfway between the bottom two lines. At that point, the pressure is reduced to make a thinner stroke that makes a smooth turn at the bottom line and crosses the heavy stroke at the baseline. Extend the thin stroke from the loop so it provides a connecting point to the next letter. That stroke should begin so that it slices through the upper part of the oval. When finished, there should be the opening between the bottom of the oval…around the 5:00 position…and the thin stroke from the loop crossing at the baseline. 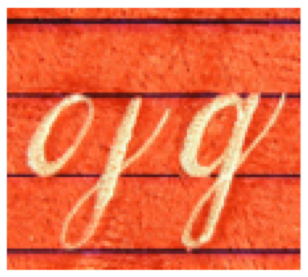 In the sample above, notice how the thin stroke crossed the heavy one and continued right into the r. That is called a serif connector where the drill is not lifted when it can continue into the next letter. The g and every letter in this complete alphabet can be seen being made in this DVD set. KEN BROWN ENGRAVING ELABORATES THE LETTERS…the f.